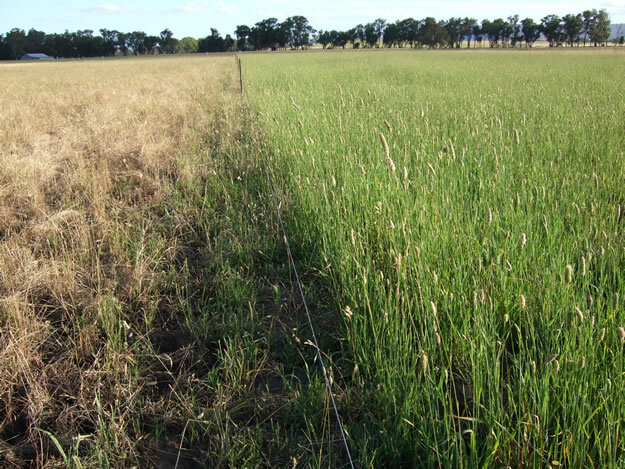 Site focus: Two sites compared production, persistence, stocking rates and economic return from different perennial options including summer active and summer dormant cocksfoots, phalaris, summer dormant tall fescue and grazing brome. Grazing crops and chicory were evaluated for their place in the system. 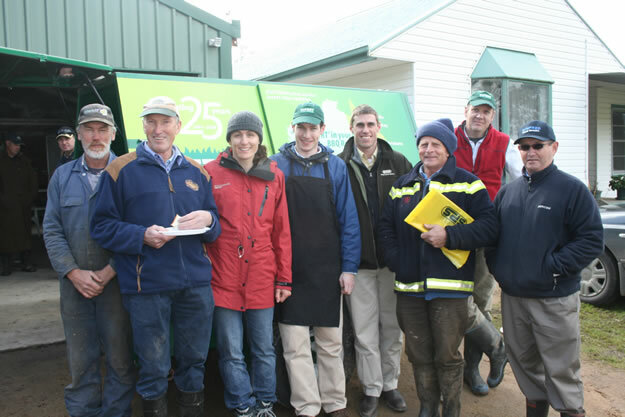 From left, Keith Dean, Kate Sargeant, HiFert representative, Rob Ryan (Stevens Pasture Seeds), Andrew Walta, HiFert Representative, Wrightson Seeds Representative. Absent: Alison Desmond. Hot and dry in summer, and the growing season runs from the autumn break through to mid October. The long-term average annual rainfall is 650mm at Euroa and 670mm at Longwood. Soils are clay-loam, naturally acidic and high in aluminium and were both limed prior to the demonstration. The sites had adequate soil fertility for establishing pastures (see section 5.1 for soil test results), although the Euroa site had particularly high phosphorus and sulphur levels. The Longwood site in comparison had moderate soil fertility and was located on a flood-plain with poor drainage. The Euroa site had good drainage however a number of light, sandy patches existed across the site where old river-beds were previously located. From 2002-2008, livestock producers in this region had experienced several years of well below average rainfall, which led to poor establishment and persistence of perennial pastures, significant decline in pasture legumes, dominance of annual weed species and poor ground cover levels. 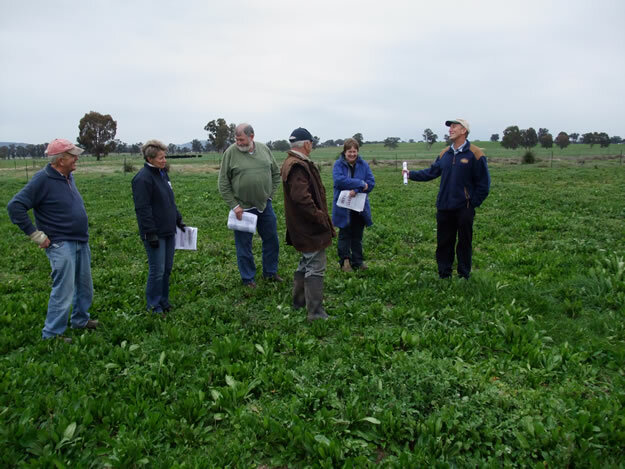 In response to these issues, two demonstration sites (Longwood and Euroa) were set up in 2009 to gain a greater understanding of the place, purpose and management requirements of perennial species and a variety of options for their local environment. Two members of the Euroa Grazing Group, John Kelly (Euroa) and Andrew Walta (Longwood) were chosen to host the demonstrations. Both properties are located on the flat plains, north of the Hume Highway. The Euroa site was run from June 2009 – December 2012. The Longwood site was run from June 2009 to December 2011.
ability to utilise the good seasons and respond to out of season rainfall when it occurs. The project demonstrated the value of perennials for increasing productivity through improvements to stocking rates, beef production and feed quality. A mixture of perennials across the farm with different summer and winter activity and maturity levels allowed for a flexible system that can cater for different livestock classes, managing variable seasons and reducing supplementary feeding requirements. The role of fast establishing annual grazing crops was important to not only control weeds in preparation for sowing, but also to fill the winter feed gap while perennials are establishing on other areas of the farm. Nitrogen deficiency – a cause for low cattle performance? This project was funded by Meat and Livestock Australia (MLA) and the Agriculture Victoria as part of the MLA Producer Demonstration Site initiative. Significant linkages were made to the BESTWOOL-BESTLAMB and EverGraze projects to boost capacity for development and extension for the project. Smyth Seeds and Stephens Pasture Seeds provided seed for the trial sites.